Wood Green: New Look – full story. What’s opened (or opening) up in your local Woolies? Or is the store still empty? Post a comment below and let us know. Previous story Wilkinson’s trial rebranding here to stay? Thanks for that Mr Value! 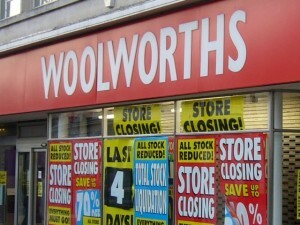 Funnily enough, I actually did an updated blog on Pound-Mart only yesterday – see http://www.soultsretailview.co.uk/2010/05/31/alworths-plans-cupar-and-forfar-openings-as-graham-pays-a-visit-to-amersham/. Both the Cupar and Forfar stores are to become branches of Alworths. ASCO stores have all gone bust and left lots of suppliers out of pocket !! Claire Robertson’s Wellworths store in Dorchester, Dorset celebrated its 100,000th customer a few weeks ago, and Wee W in Stornoway is apparently to open in August.